Vintage chic necklace created with an original collage pendant featuring an Edwardian Lady ready for tea time, a large vintage amber glass gem and ornate Victorian brass skeleton key, an amber hued plastic ring and a bit of vintage ivory lace all are hung from a large, but light weight antiqued brass chain. 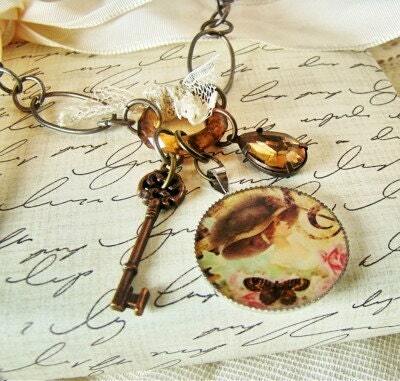 The collage for the pendant is an original creation, features a lovely Edwardian woman in her finest chapeau, a black butterfly, pink roses and set on a backdrop of antique sheet music. The 1” pendant is set in round silver plate and is sealed with jewelry grade resin. 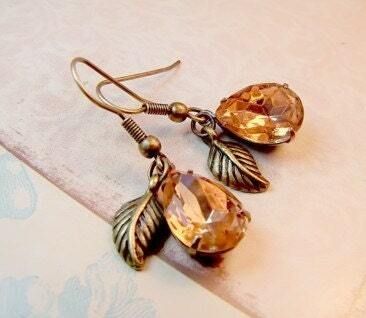 Sweet and simple, handcrafted earrings created with vintage peach glass faceted pear shaped Jewels in patina setting, accented with antiqued brass detailed leaf charms. Jewels and charms are hung from oxidized brass French ear wires. 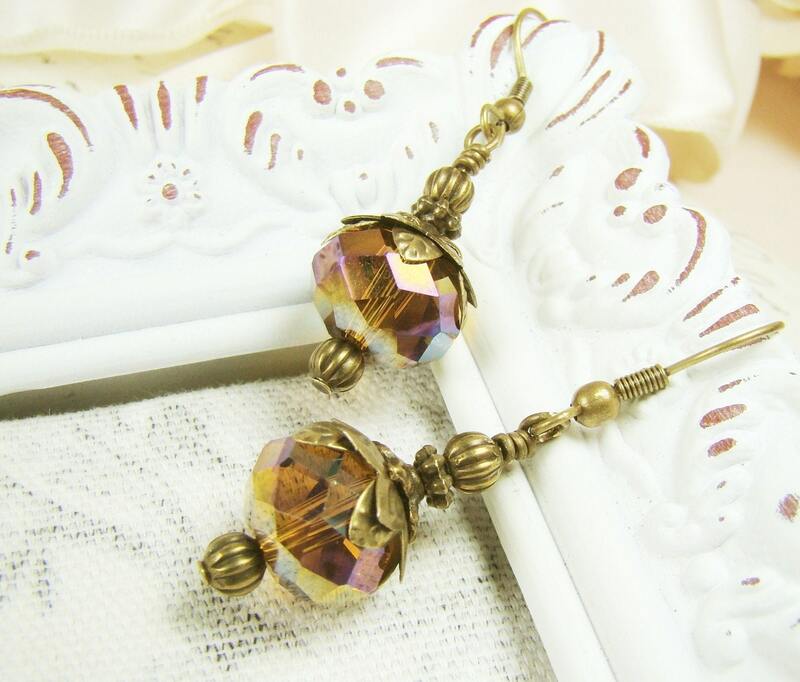 Handcrafted earrings featuring large iridescent faceted amber glass beads accented with layers of ornate leaf & floral antiqued brass & bronze bead caps and beads. These measure a little over 1 ¼” in length. 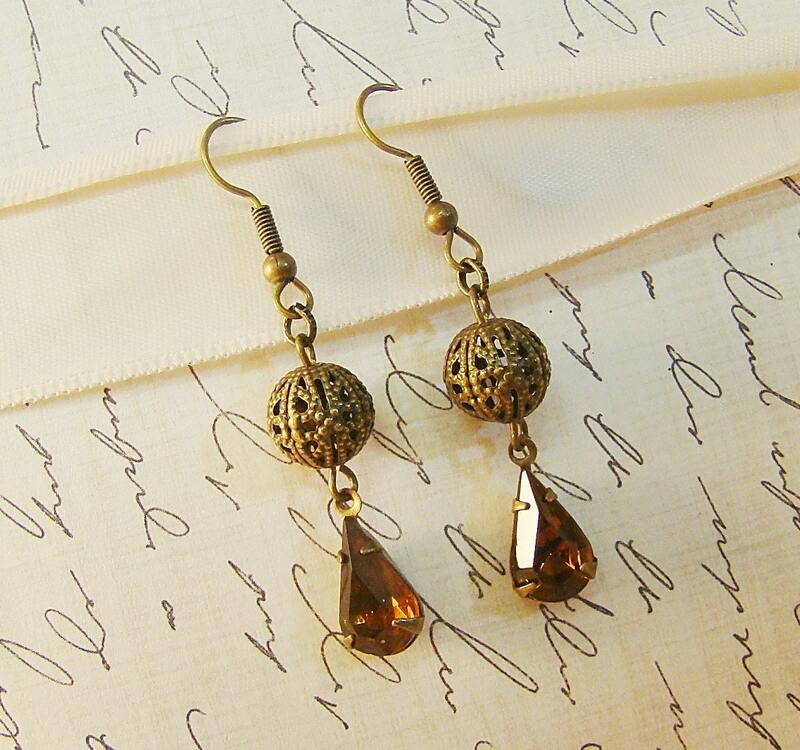 Vintage style earrings handcrafted with byzantine style antique brass filigree beads and vintage amber glass teardrop glass jewel rhinestones. Each elegant earring measures 1 ¾” long.